Recently I was shopping around for flights to Taiwan for some time off. My research found the cheapest economy prices from NYC to be around $1400 roundtrip. This is a pretty standard rate for NYC to TPE in economy. The airline was Korean Air, which is Skyteam and doesn't help me get miles/status on the airlines I fly, which are mainly Oneworld and Star Alliance. So I looked at my other options. Redeeming miles on American Airlines was my first option, because I have several hundred thousand points from Citi AAdvantage card bonues - unfortunately, none of the international availability was online so I had to call in. Typically you can get a roundtrip economy flight to Asia for 50k-65k miles under MilesAAver, but only the AAnytime Economy awards were available for 110k miles. 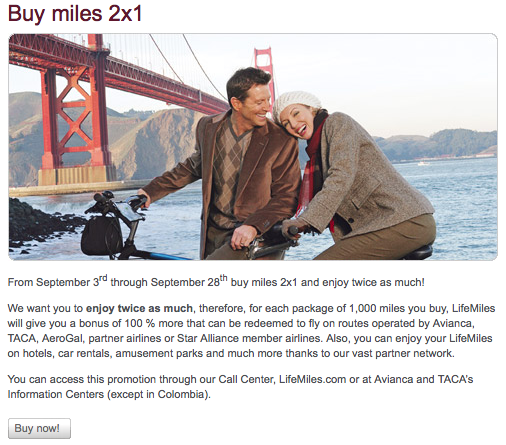 That would value my miles at 1.27c/mi, which is way less than you can redeem them for. Second option was converting my Chase Ultimate Rewards points from my Chase Sapphire card and Chase Ink Bold into United miles and getting an award ticket there. This was viable, as there was a good amount of availability for 65k economy roundtrip. Good backup option. The last option was TavaAvianca Lifemiles. They're a member of Star Alliance so they have good availability with United, Thai Airways, and Singapore Airlines. Their award program is one of the best for a few reasons. They frequently run a promotion of getting 100% bonus miles when purchasing miles - normally $30 for 1000 miles, and after the promo $30 for 2000 miles. That's approximately 1.5c per mile. Their second perk is the ability to buy award tickets with cash and miles. If you have 40% of the required miles, you can purchase the remaining miles for $12.75 per 1000 miles. So for a roundtrip business class ticket to Asia (120k miles), this cost me approximately $1650. And a roundtrip business class ticket to Europe could cost you even less than that. So in the end, I paid $1650 for a roundtrip business class flight to Asia, only $250 more than the cheapest economy ticket. Kayak listed the cheapest business class ticket for $4700! Tip: Sign up for a Lifemiles account now, since they sometimes only allow those with accounts opened prior to the promotion announcement to participate!